This diesel-powered truck emits an exhaust gas rich in black particulate matter when starting its engine. Exhaust gas or flue gas is emitted as a result of the combustion of fuels such as natural gas, gasoline, petrol, biodiesel blends, diesel fuel, fuel oil, or coal. According to the type of engine, it is discharged into the atmosphere through an exhaust pipe, flue gas stack, or propelling nozzle. It often disperses downwind in a pattern called an exhaust plume. The largest part of most combustion gas is nitrogen (N2), water vapor (H2O) (except with pure-carbon fuels), and carbon dioxide (CO2) (except for fuels without carbon); these are not toxic or noxious (although carbon dioxide is a greenhouse gas that contributes to global warming). A relatively small part of combustion gas is undesirable, noxious, or toxic substances, such as carbon monoxide (CO) from incomplete combustion, hydrocarbons (properly indicated as CxHy, but typically shown simply as "HC" on emissions-test slips) from unburnt fuel, nitrogen oxides (NOx) from excessive combustion temperatures, and particulate matter (mostly soot). Exhaust gas temperature (EGT) is important to the functioning of the catalytic converter of an internal combustion engine. It may be measured by an exhaust gas temperature gauge. EGT is also a measure of engine health in gas-turbine engines (see below). Rich air-fuel ratio requirement in cold engines: When a cold engine is started, the fuel does not vaporize completely, creating higher emissions of hydrocarbons and carbon monoxide, which diminishes only as the engine reaches operating temperature. The duration of this start-up phase has been reduced by advances in materials and technology, including computer-controlled fuel injection, shorter intake lengths, and pre-heating of fuel and/or inducted air. Inefficient catalytic converter under cold conditions: Catalytic converters are very inefficient until up to their operating temperature. This time has been much reduced by moving the converter closer to the exhaust manifold and even more so placing a small yet quick-to-heat-up converter directly at the exhaust manifold. The small converter handles the start-up emissions, which allows enough time for the larger main converter to heat up. Further improvements can be realised in many ways, including electric heating, thermal battery, chemical reaction preheating, flame heating and superinsulation. In 2000, the United States Environmental Protection Agency began to implement more stringent emissions standards for light duty vehicles. The requirements were phased in beginning with 2004 vehicles and all new cars and light trucks were required to meet the updated standards by the end of 2007. The 10% oxygen for "diesel" is likely if the engine was idling, e.g. in a test rig. It is much less if the engine is running under load. Exhaust gas from an internal combustion engine whose fuel includes nitromethane will contain nitric acid vapour, which is corrosive, and when inhaled causes a muscular reaction making it impossible to breathe. People exposed to it should wear a gas mask. In aircraft gas turbine engines, "exhaust gas temperature" (EGT) is a primary measure of engine health. Typically the EGT is compared with a primary engine power indication called "engine pressure ratio" (EPR). For example: at full power EPR there will be a maximum permitted EGT limit. Once an engine reaches a stage in its life where it reaches this EGT limit, the engine will require specific maintenance in order to rectify the problem. The amount the EGT is below the EGT limit is called EGT margin. The EGT margin of an engine will be greatest when the engine is new, or has been overhauled. For most airlines, this information is also monitored remotely by the airline maintenance department by means of ACARS. 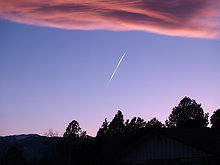 What looks like exhaust from jet engines is actually contrail. In jet engines and rocket engines, exhaust from propelling nozzles which in some applications shows shock diamonds. In steam engine terminology the exhaust is steam that is now so low in pressure that it can no longer do useful work. Mono-nitrogen oxides NO and NO2 (NOx)(whether produced this way or naturally by lightning) react with ammonia, moisture, and other compounds to form nitric acid vapor and related particles. Small particles can penetrate deeply into sensitive lung tissue and damage it, causing premature death in extreme cases. Inhalation of NO species increases the risk of lung cancer and colorectal cancer. and inhalation of such particles may cause or worsen respiratory diseases such as emphysema and bronchitis and heart disease. In a 2005 U.S. EPA study the largest emissions of NOx came from on road motor vehicles, with the second largest contributor being non-road equipment which is mostly gasoline and diesel stations. The resulting nitric acid may be washed into soil, where it becomes nitrate, which is useful to growing plants. Non-road equipment is mostly gasoline and diesel stations. When oxides of nitrogen (NOx) and volatile organic compounds (VOCs) react in the presence of sunlight, ground level ozone is formed, a primary ingredient in smog. A 2005 U.S. EPA report gives road vehicles as the second largest source of VOCs in the U.S. at 26% and 19% are from non road equipment which is mostly gasoline and diesel stations. 27% of VOC emissions are from solvents which are used in the manufacturer of paints and paint thinners and other uses. Ozone is beneficial in the upper atmosphere, but at ground level ozone irritates the respiratory system, causing coughing, choking, and reduced lung capacity. It also has many negative effects throughout the ecosystem. Carbon monoxide poisoning is the most common type of fatal air poisoning in many countries. Carbon monoxide is colorless, odorless and tasteless, but highly toxic. It combines with hemoglobin to produce carboxyhemoglobin, which is ineffective for delivering oxygen to bodily tissues. In 2011, 52% of carbon monoxide emissions were created by mobile vehicles in the U.S. Chronic (long-term) exposure to benzene (C6H6) damages bone marrow. It can also cause excessive bleeding and depress the immune system, increasing the chance of infection. Benzene causes leukemia and is associated with other blood cancers and pre-cancers of the blood. The health effects of inhaling airborne particulate matter have been widely studied in humans and animals and include asthma, lung cancer, cardiovascular issues, premature death. Because of the size of the particles, they can penetrate the deepest part of the lungs. A 2011 UK study estimates 90 deaths per year due to passenger vehicle PM. In a 2006 publication, the U.S. Federal Highway Administration (FHWA) state that in 2002 about 1 per-cent of all PM10 and 2 per-cent of all PM2.5 emissions came from the exhaust of on-road motor vehicles (mostly from diesel engines). Carbon dioxide is a greenhouse gas. Motor vehicle CO2 emissions are part of the anthropogenic contribution to the growth of CO2 concentrations in the atmosphere which according to the vast majority of the scientific community is causing climate change. Motor vehicles are calculated to generate about 20% of the European Union's man-made CO2 emissions, with passenger cars contributing about 12%. European emission standards limit the CO2 emissions of new passenger cars and light vehicles. The European Union average new car CO2 emissions figure dropped by 5.4% in the year to the first quarter of 2010, down to 145.6 g/km. 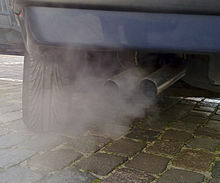 Vehicle exhaust contains much water vapour. There has been research into ways that troops in deserts can recover drinkable water from their vehicles' exhaust gases. Emission standards focus on reducing pollutants contained in the exhaust gases from vehicles as well as from industrial flue gas stacks and other air pollution exhaust sources in various large-scale industrial facilities such as petroleum refineries, natural gas processing plants, petrochemical plants and chemical production plants. However, these are often referred to as flue gases. Catalytic converters in cars intend to break down the pollution of exhaust gases using a catalyst. Scrubbers in ships intend to remove the sulfur dioxide (SO2) of marine exhaust gases. The regulations on marine sulfur dioxide emissions are tightening, however only a small number of special areas worldwide have been designated for low sulfur diesel fuel use only. One of the advantages claimed for advanced steam technology engines is that they produce smaller quantities of toxic pollutants (e.g. oxides of nitrogen) than petrol and diesel engines of the same power. They produce larger quantities of carbon dioxide but less carbon monoxide due to more efficient combustion. Researchers from the University of California, Los Angeles School of Public Health say preliminary results of their statistical study of children listed in the California Cancer Registry born between 1998 and 2007 found that traffic pollution may be associated with a 5% to 15% increase in the likelihood of some cancers. 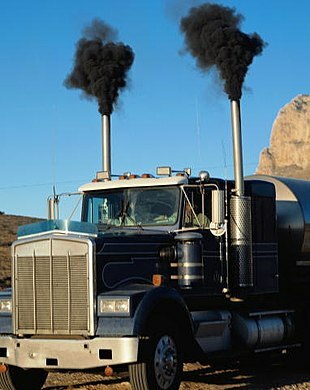 A World Health Organization study found that diesel fumes cause an increase in lung cancer. The California Air Resources Board found in studies that 50% or more of the air pollution (smog) in Southern California is due to car emissions. Concentrations of pollutants emitted from combustion engines may be particularly high around signalized intersections because of idling and accelerations. Computer models often miss this kind of detail. ^ Omidvarborna; et al. (2014). "Characterization of particulate matter emitted from transit buses fueled with B20 in idle modes". Journal of Environmental Chemical Engineering. 2 (4): 2335–2342. doi:10.1016/j.jece.2014.09.020. ^ Caiazzo, Fabio; Ashok, Akshay; Waitz, Ian A.; Yim, Steve H.L. ; Barrett, Steven R.H. (November 2013). "Air pollution and early deaths in the United States. Part I: Quantifying the impact of major sectors in 2005". Atmospheric Environment. 79: 198–208. Bibcode:2013AtmEn..79..198C. doi:10.1016/j.atmosenv.2013.05.081. ^ Roland Pease. "Traffic pollution kills 5,000 a year in UK, says study". BBC News. ^ "Average Annual Emissions and Fuel Consumption for Passenger Cars and Light Trucks" (PDF). Transportation and Air Quality. United States Environmental Protection Agency. ^ "Light-Duty Vehicle, Light-Duty Truck, and Medium-Duty Passenger Vehicle -- Tier 2 Exhaust Emission Standards". Emission Standards Reference Guide. United States Environmental Protection Agency. 14 November 2012. ^ Self-Study Programme 230: Motor Vehicle Exhaust Emissions (PDF). AUDI. April 2000. Retrieved 23 March 2012. ^ "Race Fuel - Nitromethane". www.turbofast.com.au. ^ Hamra, GB; Laden, F; Cohen, AJ; Raaschou-Nielsen, O; Brauer, M; Loomis, D (November 2015). "Lung Cancer and Exposure to Nitrogen Dioxide and Traffic: A Systematic Review and Meta-Analysis". Environmental Health Perspectives. 123 (11): 1107–12. doi:10.1289/ehp.1408882. PMC 4629738. PMID 25870974. ^ Turner, MC; Krewski, D; Diver, WR; Pope CA, 3rd; Burnett, RT; Jerrett, M; Marshall, JD; Gapstur, SM (21 August 2017). "Ambient Air Pollution and Cancer Mortality in the Cancer Prevention Study II". Environmental Health Perspectives. 125 (8): 087013. doi:10.1289/EHP1249. PMC 5783657. PMID 28886601. ^ "Health". Nitrogen Dioxide. United States Environmental Protection Agency. 14 February 2013. ^ "The Regional Transport of Ozone: New EPA Rulemaking on Nitrogen Oxide Emissions (EPA-456/F-98-006)" (PDF). United States Environmental Protection Agency. September 1998. ^ a b "State and County Emission Summaries: Nitrogen Oxides". Air emission sources. United States Environmental Protection Agency. 25 October 2013. ^ a b "State and County Emission Summaries: Volatile Organic Compounds". Air emission sources. United States Environmental Protection Agency. 25 October 2013. ^ "Volatile Organic Compounds (VOCs)". Toxic Substances Hydrology Program. United States Geological Survey (USGS). 12 April 2013. ^ Omaye ST. (2002). "Metabolic modulation of carbon monoxide toxicity". Toxicology. 180 (2): 139–150. doi:10.1016/S0300-483X(02)00387-6. PMID 12324190. ^ "State and County Emission Summaries: Carbon Monoxide". Air Emission Sources. United States Environmental Protection Agency. 25 October 2013. 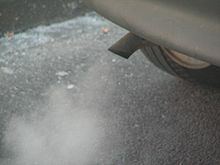 ^ "Exhaust emissions: What comes out of your car's exhaust?". Automobile Association Developments Limited. 23 February 2012. ^ "Air Toxics from Motor Vehicles" (PDF). Transportation and Air Quality. United States Environmental Protection Agency. ^ Kurt, OK; Zhang, J; Pinkerton, KE (March 2016). "Pulmonary health effects of air pollution". Current Opinion in Pulmonary Medicine. 22 (2): 138–43. doi:10.1097/MCP.0000000000000248. PMC 4776742. PMID 26761628. ^ Bourdrel, T; Bind, MA; Béjot, Y; Morel, O; Argacha, JF (November 2017). "Cardiovascular effects of air pollution". Archives of Cardiovascular Diseases. 110 (11): 634–642. doi:10.1016/j.acvd.2017.05.003. PMC 5963518. PMID 28735838. ^ Babadjouni, RM; Hodis, DM; Radwanski, R; Durazo, R; Patel, A; Liu, Q; Mack, WJ (September 2017). "Clinical effects of air pollution on the central nervous system; a review". Journal of Clinical Neuroscience. 43: 16–24. doi:10.1016/j.jocn.2017.04.028. PMC 5544553. PMID 28528896. ^ Region 4: Laboratory and Field Operations — PM 2.5 (2008).PM 2.5 Objectives and History. U.S. Environmental Protection Agency. ^ Mazzi, Eric A.; Dowlatabadi, Hadi (2007). "Air Quality Impacts of Climate Mitigation: UK Policy and Passenger Vehicle Choice". Environmental Science & Technology. 41 (2): 387. Bibcode:2007EnST...41..387M. doi:10.1021/es060517w. ^ "Transportation Air Quality: Selected Facts and Figures". U.S. Department of Transportation Federal Highway Commission. 2006. Retrieved 2010-04-14. ^ IPCC, 2013: Summary for Policymakers. In: Climate Change 2013: The Physical Science Basis. Contribution of Working Group I to the Fifth Assessment Report of the Intergovernmental Panel on Climate Change [Stocker, T.F., D. Qin, G.-K. Plattner, M. Tignor, S.K. Allen, J. Boschung, A. Nauels, Y. Xia, V. Bex and P.M. Midgley (eds.). Cambridge University Press, Cambridge, United Kingdom and New York, NY, USA. ^ "Commission plans legislative framework to ensure the EU meets its target for cutting CO2 emissions from cars". European Commission. 2007-02-07. ^ "EU Average New Car CO2 Emissions Down 5.4 Percent in Q1". autoevolution. SoftNews NET. 2010-04-19. ^ "recovering water from diesel exhaust - Google Search". www.google.co.uk. ^ "EPA Plain English Guide to the Clean Air Act". ^ Reinberg, Steven (9 April 2013). "Smog Exposure During Pregnancy Might Raise Child's Cancer Risk: Study". USNews. ^ Int Panis L; et al. (2006). "Modelling instantaneous traffic emission and the influence of traffic speed limits". Science of the Total Environment. 371 (1–3): 270–285. Bibcode:2006ScTEn.371..270I. doi:10.1016/j.scitotenv.2006.08.017. PMID 17049967. Cone, Tracie (13 November 2008). "California Air Pollution Kills More People Than Car Crashes, Study Shows". Huffington Post. "Automotive Exhaust Chemicals: disease causing effects". Alpha Online. Environmed Research Inc. Archived from the original on 2014-07-05. "Cars, Trucks, and Air Pollution". Clean Vehicles. Union of Concerned Scientists. 3 September 2013.